Art in public space is an essential element of a modern city – in every important European or Polish city: London, Berlin, Warsaw, Krakow or Gdańsk – there is a project devoted to public art presenting works of artists in the city space. 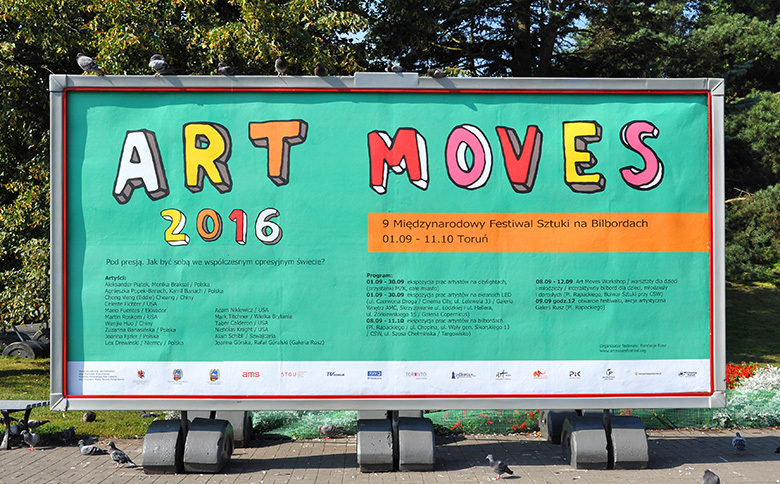 The International Art Moves Festival has been presenting artworks in Toruń for 9 years. It turns the city space into an enormous art gallery where apart from debutants, one can admire the works of renowned artists from all over the world. Art enters the city space – the works of artists talk directly to recipients. This is extremely important because only a small percentage of Poles visit traditional art galleries and museums. 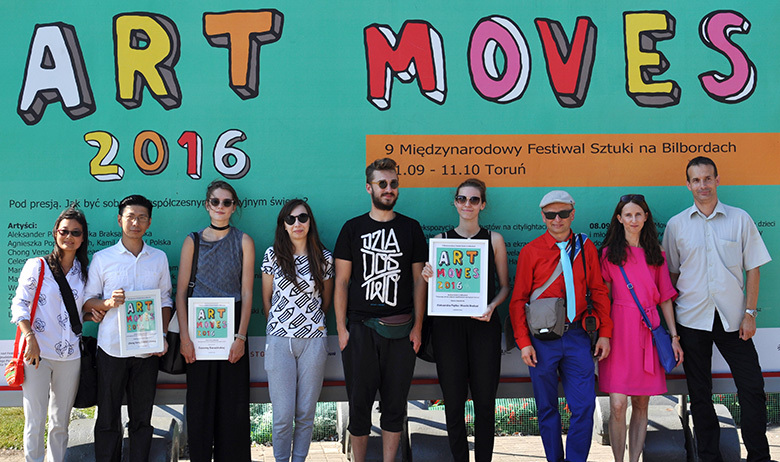 As part of the festival, the works of international artists are presented in Toruń. They focus on important and current issues. This year, artworks relating to the theme of the event: „Under pressure. How to be yourself in the contemporary oppressive world?” will be presented by means of carriers that are usually used to show advertisements: billboards, city lights and LED displays. One of the main elements of the festival is the annual international competition for the best billboard work. For the competition exhibition, the most interesting pieces by talented artists from all over the world are selected. These works constitute a creative artistic statement centred around the festival’s competition slogan. We prepare the topics for our annual competition in such a way, as to make them reflect the processes and social phenomena that shape the contemporary, global world. These topics are rooted in our deep sociological, psychological and philosophical considerations and they testify to our concern with the shape of the reality surrounding us. This year, the theme of the Art on Billboards Competition was „Under pressure. How to be yourself in the contemporary oppressive world?”. 643 artists from 62 countries entered the contest, we received 1204 artworks from Cuba, USA, China, Armenia, Lebanon, Russia, Ecuador, France, Kyrgyzstan, Iran and many others! The substantial interest in the festival among the artists from all over the world points to the enormous potential of the idea behind the festival and of art presented in the public space – the place which encourages deeper reflection and social communication. This competition slogan can be treated as a metaphor of all the processes taking place in the world today. We live under constant pressure: of time, perfection, success, exorbitant requirements. Different pressure groups – politicians, media, corporations, fundamentalists, radicals – exert pressure on us. However, not only they – we also exert pressure on ourselves. Omnipresent pressure and chaos of contradictory messages we receive intensify our fear. Our internal pressure is growing – it tells us to constantly raise the bar, work more and faster, live more intensely. The pressure never stops – we experience it from the cradle to the grave. How to be yourself in such a situation? The advertising message we are bombarded with tells us: be yourself and at the same time be like others and choose this or that product. Is it possible to be yourself and like others at the same time? What does it mean to be yourself? Is it worth being yourself – the only one, unique human being? How to do it in the contemporary oppressive world? selected 10 most interesting projects which were exhibited on billboards located on Pl. Rapackiego in Toruń. 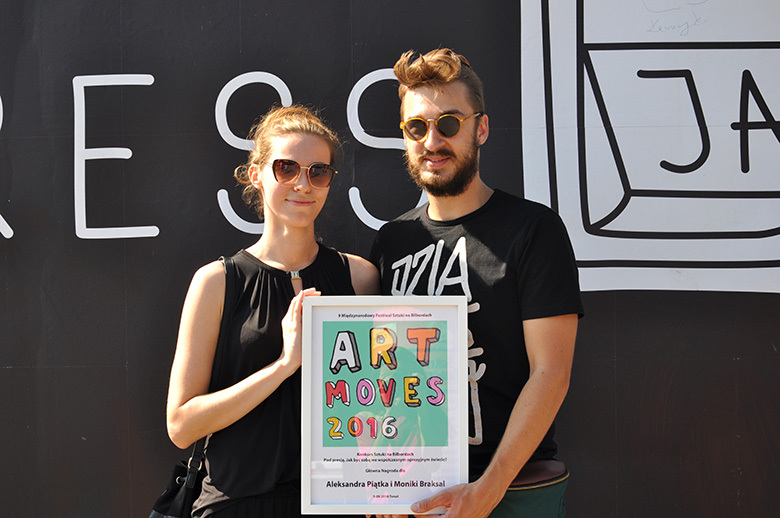 The jury decided to confer the main award of 5000 PLN to Aleksander Piątek and Monika Braksal from Poland. 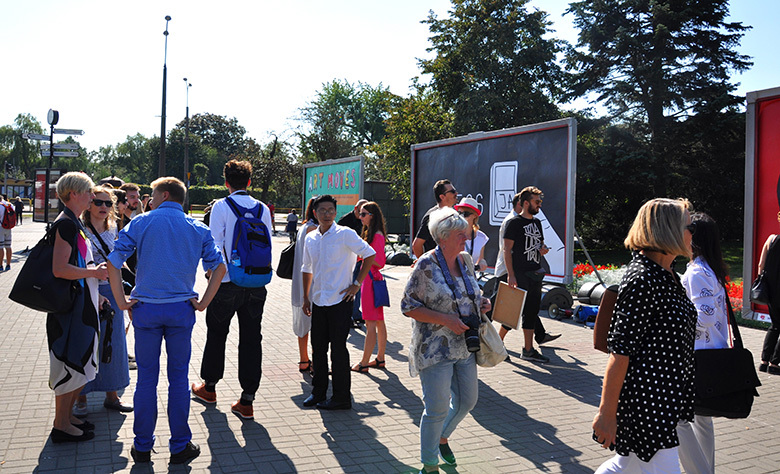 Their work was also exhibited on 5 billboards in Warsaw. The festival has been co-funded by the Toruń Municipality.